Islam News Room - Can We "See" God? Will we see Him after we die (in the Next Life)? The Quran (Recitation of Almighty God) says - "YES"! This question is rather easy for the Muslims. As a matter of fact, Islam teaches that the whole purpose of this life is a test. The trials and tests that we receive from Allah are enumerated in His Book, the Holy Quran. The important thing to keep in mind is that Allah does not force us to come to Him or to submit to what He has ordained. This means that we always have a choice. And one of the important things about that choice is that Allah never makes it so obvious that their would no longer be a choice. So, all through the human's life there is the opportunity to turn away from evil and choose to worship Allah on His Terms. At the same time, there is of course the equal opportunity to turn away from guidance and then become of the loosers. I ask Allah to save us from that, ameen. If anyone ever had seen Allah - how could they then be in a fair test? Also, in Islam we know that if Allah "reveals" Himself to a mountain it would crumble out of the tremendous experience. And the prophet's wife, Ayesha, may Allah be pleased with her, told us that if anyone says that the prophet, peace be upon him, saw Allah Subhannah wa Ta'ala, that person is a liar. The biggest goal for the Muslims in the Next Life is not, as they so wrongly protray it on TV and the newspapers, to have virgins running around and wine to drink, not at all. The biggest and highest honor of the Next Life is to have a chance to actually stand in front of the "Presence of Allah." And this is described in authentic hadeeths (teachings of Muhammad, peace be upon him). Although we are all definitely looking forward to the Paradise and all that it contains, we look to this as being the highest and greatest of all honors and favors of Allah - the opportunity to just be "close to Allah" from time to time in the Paradise. I get all excited just thinking about it. These are some of the reasons why we don't "see" Allah in this life. However, there is another very important reason that you should be very aware of when answering a question of this kind. That is, Allah cannot be seen in the life of this world, nor can He be heard, smelled, felt, imagined, or any other sense that we have. As I have already outlined, that would violate the principle of Him not interfering with our choices. Additionally, Allah is never to be compared to His creation in any way, shape or form. This means that He does not enter His creation, nor does He grant any of His creation any of His attributes or power for that matter. All power, might and strenght are with Allah and there is none who can challenge Him, ever. We do not put Allah in the creation. We say what Allah says about Himself in His Book, that He created the Heavens and the earth in six days and then He rose above His Throne (in a manner that befits His Majesty). We don't say He sits or lays on His throne because He did not say that about Himself. Muslims are to take care never to say anything about Allah that they do not have the authority to say. This is blasphemy and it is kufr (out of Islam). Allah says that He does not compare in any way to any part of His creation. He tells us that He is "All Hearing, All Seeing, All Compassionate, All Loving, All Mighty, etc." But He never says that He is "all present" in His creation. Also, we know that He does not give people powers like superman. People have claimed to have powers with Allah, but they are liars (even if they claim to be Muslims). There are no partners with Allah and He is far above what ever they would try to compare to Him in anyway. The statement in Arabic is "Laa howla wa laa kowata illa bil lah." 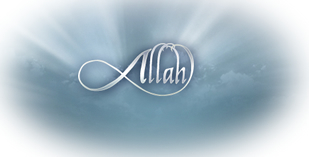 (There is no might or power anywhere at anytime, except the Might and the Power of Allah." I hope this has helped you in preparing your answer for the people who are asking you about Islam and may Allah forgive me for my poor translations, and weakness in replying to you, ameen. You so right, Islam is a way of life and the only Reality. Jesus Christ prophecied the coming of Mohamed. Jesus Christ will return to the world and destory the cross, kill the pig and destroy the anti-Christ and lead trute believers in victory and peace. Proof is what Islam offers in today's mixed up world and that is one reason my family and me accept the message - no god to wroship but Allah and Mohamed his messenger. Tahnks to you Islam Newsroom. I pray vor all of you. Islam is only religion in which Allah is beatifully defined in Surah Ikhlas. No such definition is available in any religion of the world. This Surah directly addressing the entire mankind who is Allah. He is unique and no creation is compareable to Him and his powers.